Deric graduated with a bachelor's degree and a master's degree in music performance from Northwestern University and the University of Michigan, respectively. He enjoyed a professional career as a band director and then as a professional trumpeter as a member of the West Point Band. Deric's life was changed drastically in 2003 when his wife, Kristen, was diagnosed with stage 4 liver cancer. Apart from his time-consuming role as caregiver, he felt led to alter his professional aspirations. 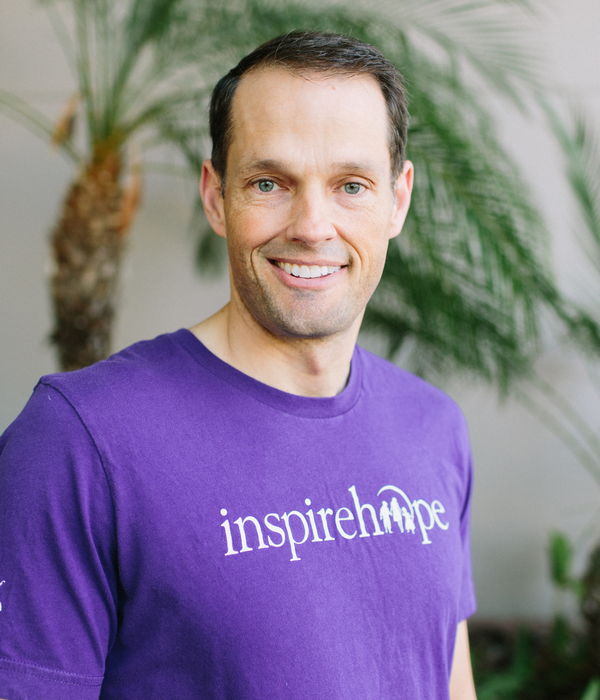 Deric and Kristen founded Inheritance of Hope in 2007, and after completing an MBA (with distinction) from New York University's Stern School of Business, Deric became the CEO of Inheritance of Hope. 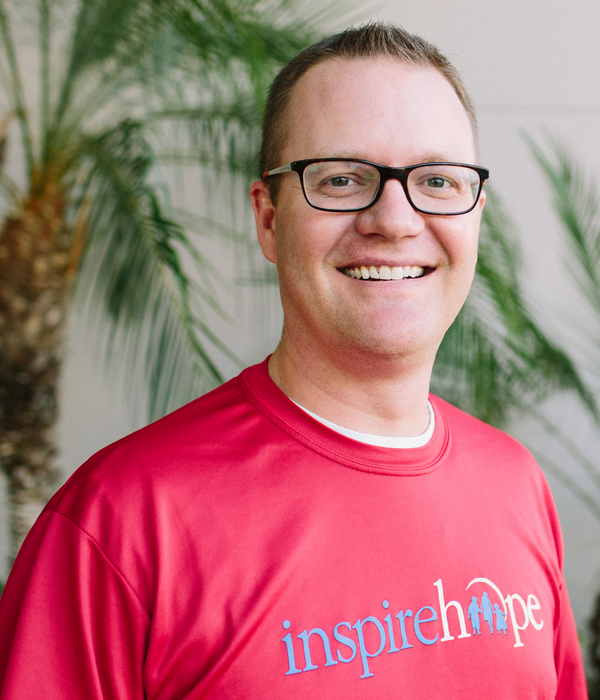 His passion is for serving and supporting families like his, families living with a parent battling a life-threatening illness. In 2015 Deric was named an Ellis Island Medal of Honor recipient. Deric lives with his wife, Maitreya, and three children in North Carolina. Betsy has a biology degree from St. Olaf College and a master's degree in youth and family ministry from Luther Seminary. 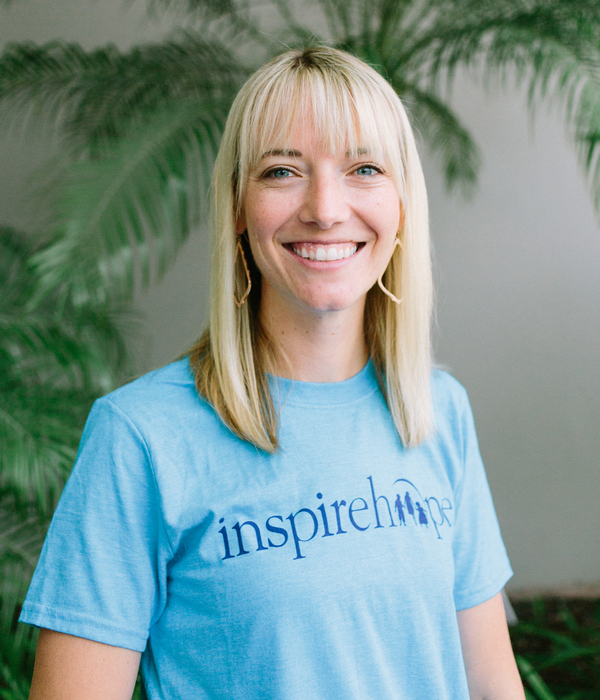 She first heard Kristen Milligan speak in 2007 and was instantly drawn to the vision of hope-filled, intentional legacies. 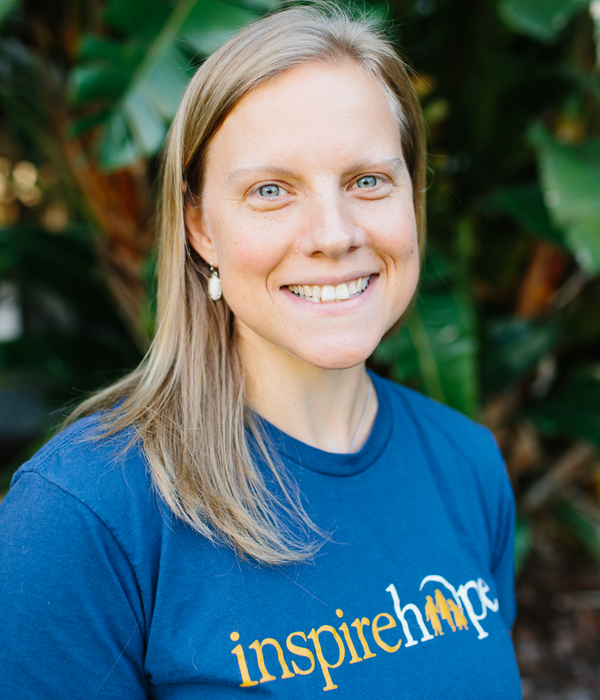 Betsy has served Inheritance of Hope as a Team IoH runner and fundraiser, Legacy Retreat® volunteer, and Legacy Retreat® Coordinator. She also helped create the Nut House Challenge to benefit IoH. Betsy combines mastery of event logistics with strong yet gentle leadership of the many coordinators and volunteers involved in our events. No matter what challenges she faces (including a hurricane! ), Betsy stays poised and leads with great graciousness. She is excited about thoughtfully planning our events so young families with terminally ill parents can make lifelong memories and build lasting legacies. Betsy lives with her husband, Brian, and their three children in Minnesota. Eric holds degrees from the University of Northern Iowa (BA) and Duquesne University (MA) as well as a certificate in marketing strategy from Cornell University. Prior to joining the Inheritance of Hope family, Eric worked at the US Military Academy in West Point, NY, where he served as the Publicity Division Chief of the West Point Band. 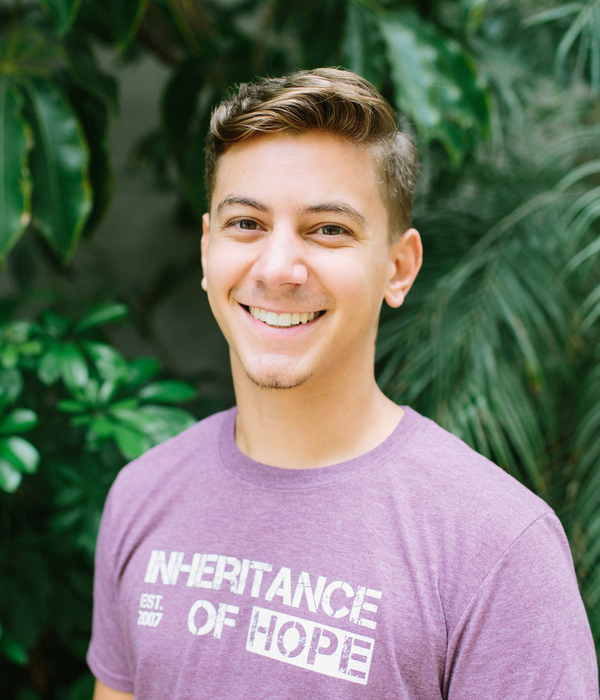 As Marketing & Communications Director, Eric oversees all print, press, web, and social media marketing materials while implementing Inheritance of Hope’s marketing/communications strategy. His energy, enthusiasm, and creativity increase awareness about Inheritance of Hope and strengthen engagement with our expanding audience. He is passionate about telling our story in order to serve more young families facing the loss of a parent. Eric lives with his wife, Trina, and their two children in Iowa. Audra graduated from the University of Florida with a BS in journalism. She spent 12 years in financial services management, most recently as Chief of Staff at a registered investment adviser in Tampa and Vice President at a hedge fund in New York City. Audra was named the 2015 Emerging Leader by the Tampa Chamber of Commerce. As Strategic Initiatives Director, she supports the core cross-functional areas of operations, strategic projects, administration, and marketing. Audra knows how to coordinate efforts so that goals are reached effectively and efficiently, yet she is also endlessly patient and willing when serving people in need. She is profoundly inspired by her personal relationships with Co-Founders Deric and Kristen Milligan, and she understands what a gift it is to champion their legacy by serving IoH's community of extraordinary families. Audra lives in Tampa, Florida. Jill graduated from Fairleigh Dickenson University with a BS degree and has worked as a physical therapy assistant. She cherishes her roles of wife, mother, and friend, and she aptly describes herself as a natural-born cheerleader. Her spirit is full, her voice is loud, and her smile is contagious. Her heart is tender for all those who struggle, and she is not one to sit by when she sees a need. Jill's life has been touched by life-threatening illness through the experience of loved ones, and she has always been the first at the door to lend support and encouragement. Her gifts, her talents, and her extraordinary heart have greatly blessed Inheritance of Hope and each family we have been honored to serve since Jill came on board -- she is a perfect fit for our mission. Jill lives with her husband, Adam, and their four children in Florida. 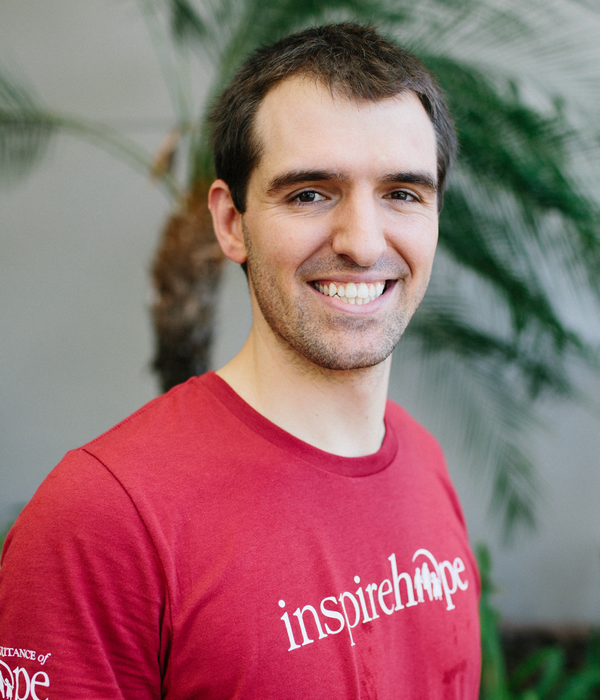 Aaron graduated from Carson-Newman College with a degree in math and Spanish and served in ministries from Kids Across America in Missouri, to Pioneers International in Bolivia, to New York, where his hands were in the development of Inheritance of Hope since its earliest days. While working with IoH, Aaron completed his MDiv and MBA degrees from Mercer University. His focus is on making the best use of resources, finding ways to better serve our families. However, Aaron's role is not simply behind the scenes. His heart for each of the families is seen through his selfless and sincere service during our Legacy Retreats®. The children LOVE him! Aaron's gifts and talents ensure success in whatever he feels led to pursue, but our prayer is to keep Aaron with IoH for many years to come! Aaron lives with his wife, Allison, and their two children in Minnesota. Heather earned an English degree from UNC-Chapel Hill and a teaching license from Brevard College. She has worked as a veterinary technician and receptionist, public school teacher, and homeschool teacher, and she has also taken on administrative and leadership roles with Cub Scouts and the children’s ministry at her church. In 2014 her husband, John, was diagnosed with ALS, and she became his full-time caregiver. Their family attended the August 2014 Legacy Retreat®. 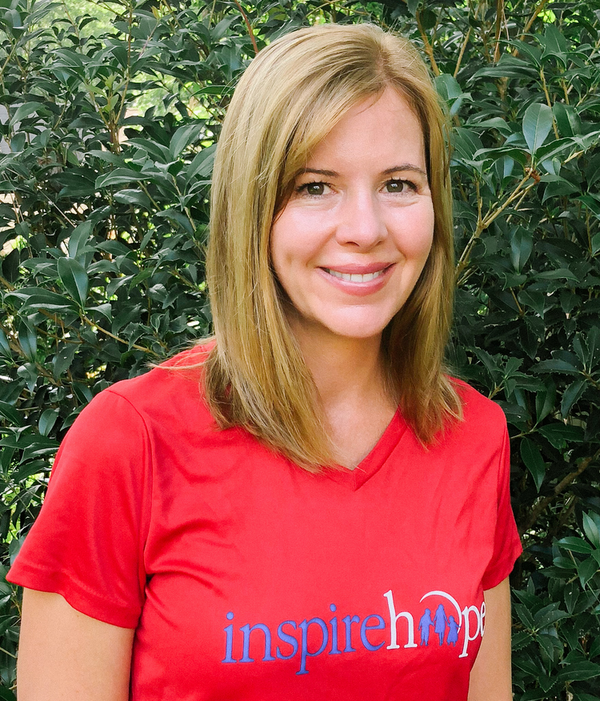 Since John's death in March of 2016, Heather has served as a Team IoH fundraiser, Legacy Retreat® Coordinator, 2017 Legacy Run Director, and Administrative Assistant. As Supplies Coordinator, she makes sure our whole team and every family we serve have everything needed for enjoyable experiences. 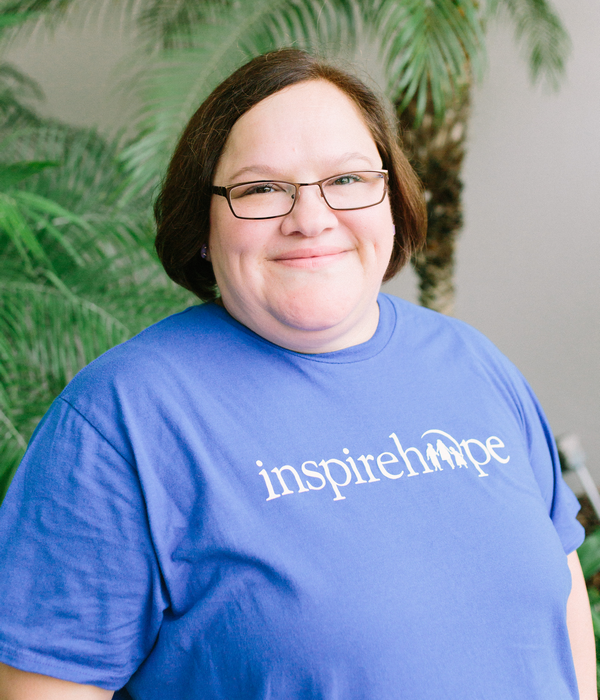 She is grateful that her experience with terminal illness allows her to connect with and inspire hope in families like her own. Heather lives in North Carolina with her husband, Tom, and their four sons. Mikki attended the University of Oklahoma and the Cleveland Institute of Music, earning degrees in music performance. While working as a trumpeter for the West Point Band, she learned of Deric and Kristen Milligan's story and was inspired to help in a capacity that showcased her incredible creative artistic ability. With camera in hand, she works tirelessly to capture memories made at Legacy Retreats®, furthering legacies with timeless portraits. Mikki's camera work has been published with Seventh Generation, Pampers, Canon, and Zillow. Her easy-going and can-do spirit, coupled with a keen eye for visual creativity, bring a fresh artistic vision to IoH's mission. Mikki lives with her husband, Joe, and their three children in New York. 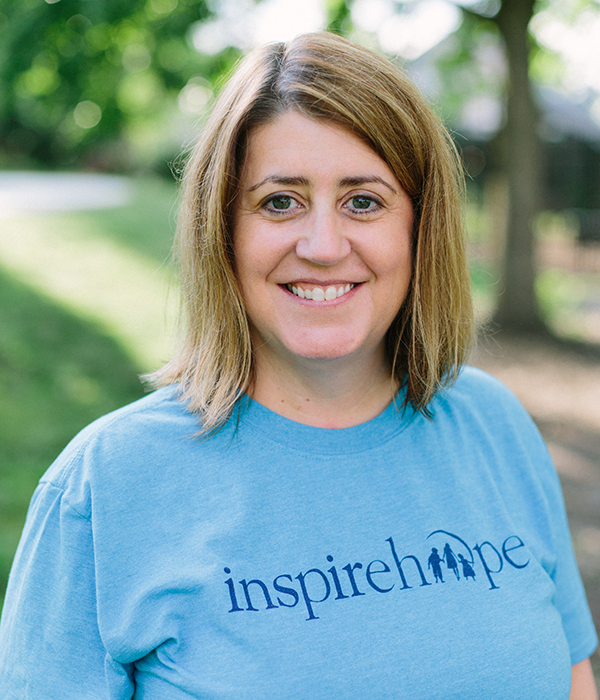 Angie Howell is constantly inspired by the people she meets in the Inheritance of Hope family. Her connection to IoH goes back to Davidson College, where she met Kristen Grady Milligan the first week of their freshman year. At a college reunion, Angie heard about the work Kristen and her husband Deric were doing through IoH, and the two former hallmates got back in touch. 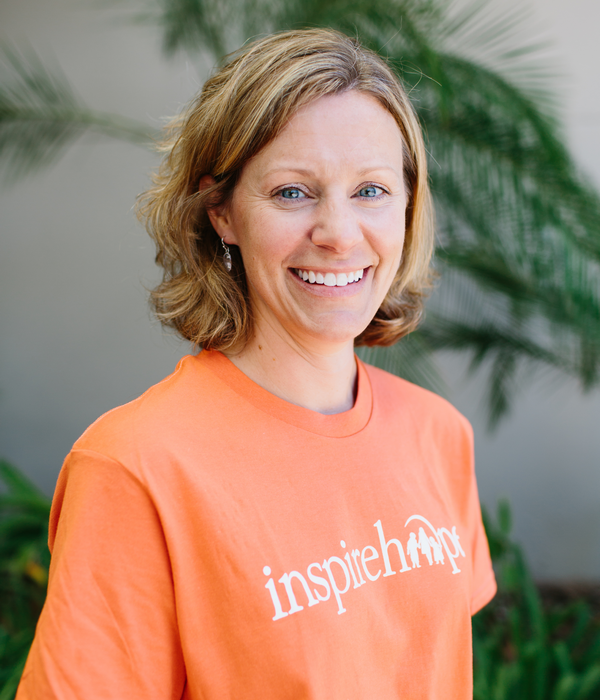 Angie has served as a Legacy Retreat® volunteer and Coordinator. 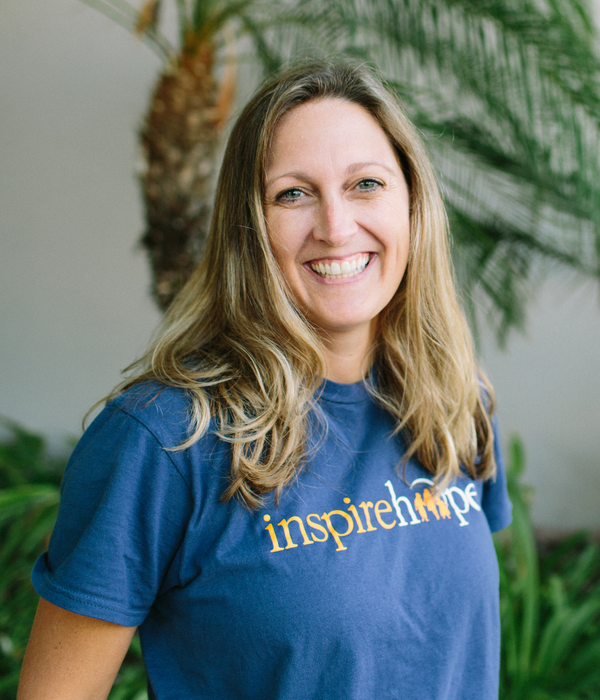 Now, as Communications Manager, Angie’s gifts for thoughtfully connecting with people and delivering articulate, inspiring communications shine as she discovers and tells the stories of IoH. Other than working for IoH, her favorite job has been that of a stay-at-home mom. Before having children, Angie worked as a NASDAQ market maker and listed equity trader. Angie lives in Atlanta with her husband, Clay, their two daughters, and wild but lovable dog. Dillon Padgett studied at Florida Atlantic University, earning a bachelor’s in computer science and a minor in Spanish. In 2016, he moved to Lansing, MI to accept a position with IBM, where he currently resides and works in conjunction with his new position with IOH as Technology Manager. Dillon holds himself to the highest standards in everything he does. He is diligent, disciplined, and committed to excellence. At Legacy Retreats his tender heart shines through, and he is gifted at relating to many different kinds of people. Dillon can be counted on to help with whatever needs to be done; he is very capable individually and is also a team player who gladly serves wherever there is a need. Dillon currently lives in Lansing, MI. Rebecca graduated from Houghton College with a degree in biology. She has a huge heart to serve and the abilities and willingness to serve in many ways and in many situations. Rebecca has worked in sports ministry at Push the Rock and Sports Friends Ethiopia, on service projects in Mexico and Brazil and Germany, and volunteered and worked as a project assistant at Inheritance of Hope Legacy Retreats®. Also to benefit IoH families, she has run and fundraised in 4 half marathons and 3 marathons. Rebecca is a gifted organizer, keeping up with the countless details needed for smooth events. Her diligence to get things done and done well is matched by her humility; Rebecca never draws attention to herself, yet her impact is profound. 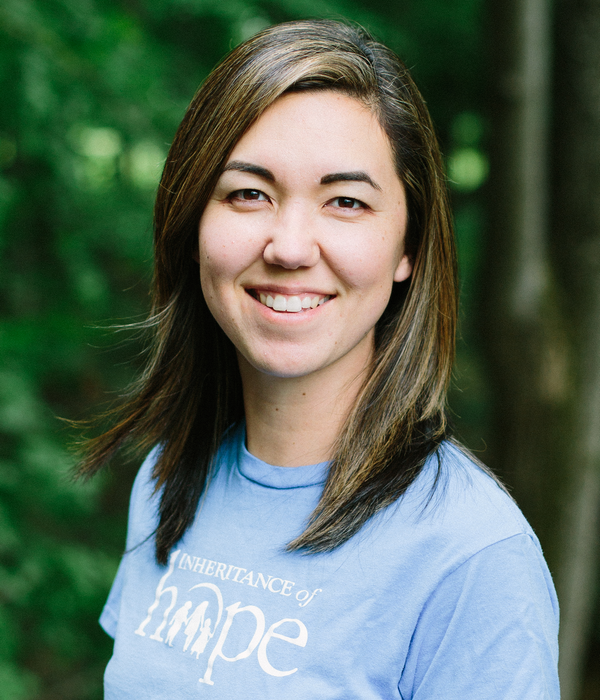 She is excited to be serving families at IoH, and we are excited to have her in a leadership role! Rebecca lives in New York. Before staying home full-time to homeschool her children, Dena was the owner/operator of a retail picture framing business in Grand Rapids, MI. Dena began volunteering at Legacy Retreats with her husband, Blake, in October, 2016. Their dear friend, John Crawford, and his family attended a Legacy Retreat in 2014, and after hearing about the impact Inheritance of Hope had on the Crawfords, Dena and Blake knew they wanted to get involved. Dena also served as a Coordinator before moving in to her new role. 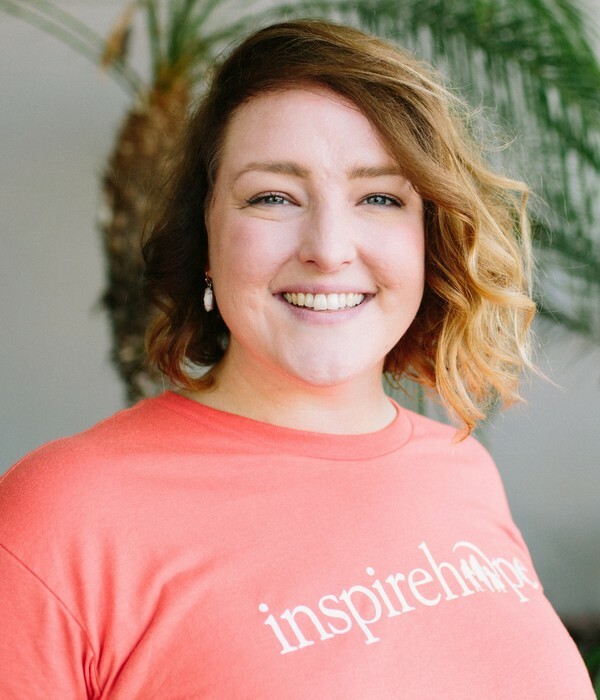 As Legacy Retreat & Venue Coordinator, she will use her skills for organizing the many details of event planning with various venues as Inheritance of Hope continues to grow. Dena is passionate about helping families make memories and leave a legacy--just as she herself strives to do for her own children and grandchildren. Dena lives in Brevard, NC with her husband, Blake and their teenage son. 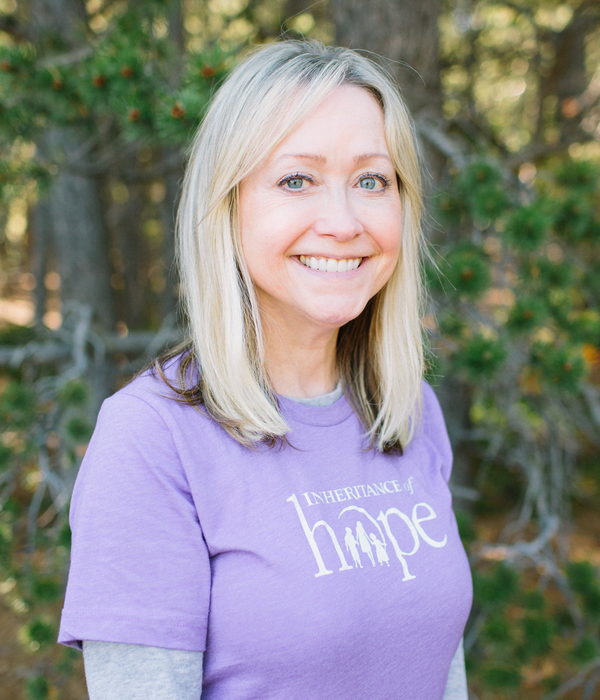 Inheritance of Hope is one of Julie’s passions. Her family was served at the 2011 Legacy Retreat in NYC, and she has been involved ever since--serving as a volunteer, coordinator, and now as Volunteers Manager. A licensed counselor, Julie has a master’s degree in counseling, and in her private practice specializes in ministering to those experiencing loss. With her background as a Hospital Chaplain, she has a tender heart for families like her own that have walked through terminal illness. She is so grateful for her teenager Sam, who reminds her every day of his Dad, Ken, and encourages her to love deeply and answer all kinds of tough questions. Julie will tell you that she is no longer defining herself by what has happened to her, but instead she is seeing herself in the light of what God is doing in her. Julie and her son live in Minnesota. A child-life specialist and former palliative care and hospice worker, Heidi brings a wealth of experience to our IoH team. She graduated from Sacramento State University with a degree in Child Development. Heidi has a special heart for IoH families--as a child, she watched her father overcome a life-threatening illness only to have her mother succumb to cancer a few years later. Her deep compassion and commitment to our mission drives Heidi to love and serve our families in her role as Families Manager. 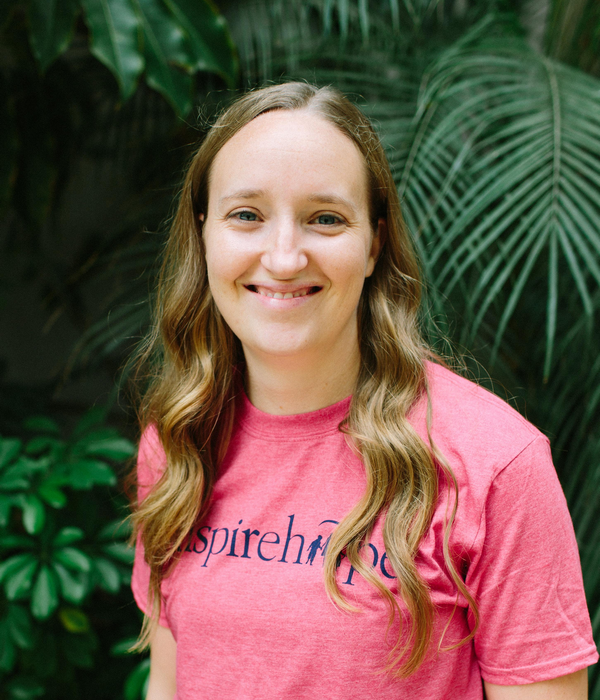 Heidi might be the first friendly phone call a family receives, and her goal is to give each family attending our Legacy Retreats a top-notch experience from that first contact to the last hug goodbye. Heidi lives in California with her husband, Brian and three children. Gina has over 20 years of counseling experience, and most recently added a Master’s of Spiritual Formation and Leadership to her professional credentials. She earned her undergraduate degree from King University in Tennessee, and a Master’s of Counseling from the University of North Carolina at Charlotte. In 2002, Gina moved to New York City to answer a call for counselors post 9/11. Since then, she has specialized in grief, trauma, and loss. In her private practice she sees clients of all ages, but she especially has a heart for the children of IoH families. Gina has also worked as a youth counselor and in curriculum development for psychoeducational programming. As our Legacy Resources Manager, Gina ensures that all IoH families experience the best resources IoH has to offer. Gina lives in North Carolina with her terrier, Lily. Spencer Reid’s introduction to Inheritance of Hope was in May 2015 when his family was served on a Legacy RetreatⓇ. As soon as he could, Spencer began volunteering himself, and joined the IoH staff shortly thereafter. Having worked for Marriott for four years, Spencer has experience in operations, Human Resources, and sales. His heart for serving families combined with his sharp analytical skills and attention to detail make him the perfect fit for his role as Development Coordinator. As the director of Team IoH, Spencer helps our athletes meet their fundraising goals, and he also works behind the scenes to keep our internal development systems working smoothly. Spencer graduated from the University of Maryland with degrees in Economics and French, and previously created a YouTube channel. Spencer lives in Germantown, Maryland. Shelby Jo is currently a student at Appalachian State University working toward completing her Bachelor’s degree in Elementary Education. In 2014, Shelby Jo and her family attended the NYC Legacy Retreat® shortly after her mother was diagnosed with metastatic breast cancer. 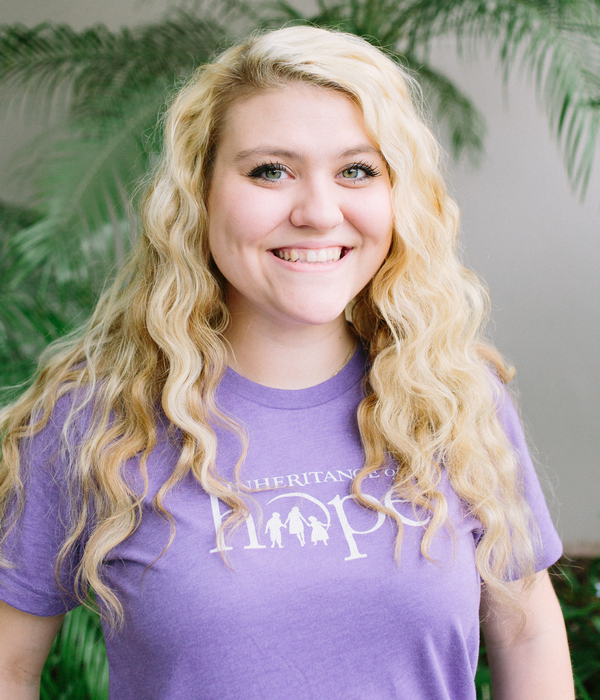 Since becoming eligible to volunteer, she has served on several retreats and is now our Marketing Intern. In her new position, she will cultivate relationships within the IoH family through various social media platforms. As a family member served, Shelby Jo can connect families in a unique way. Her heart, southern charm, and passionate love for the families she serves help her bring a special joy to the IoH family. Shelby Jo lives in Boone, North Carolina while she completes her degree.